July is historically the hottest month in the D.C. area. After a fairly cool Fourth of July weekend, the heat is finally on. Storm Team 4's Lauryn Ricketts explains what's going on and how long it will last. WASHINGTON — Hello heat, and hello humidity! Get ready for it to finally feel like summer in the D.C. area as we are at the start of the first heat wave of summer. July is historically our hottest month, with the average temperature topping out at 89 degrees from July 7 to July 22 before slowly declining. After a fairly cool Fourth of July weekend, the heat is finally on. Temperatures this week will continue to top out in the 90s, with humidity continuing to pump into our region around an area of high pressure parked over the Deep South. This pattern has no signs of breaking at least through Saturday. After that, a frontal system will pass through the region, bringing us a drier airmass for at least Sunday and Monday. Until then, we will have to deal with heat as well as humidity. 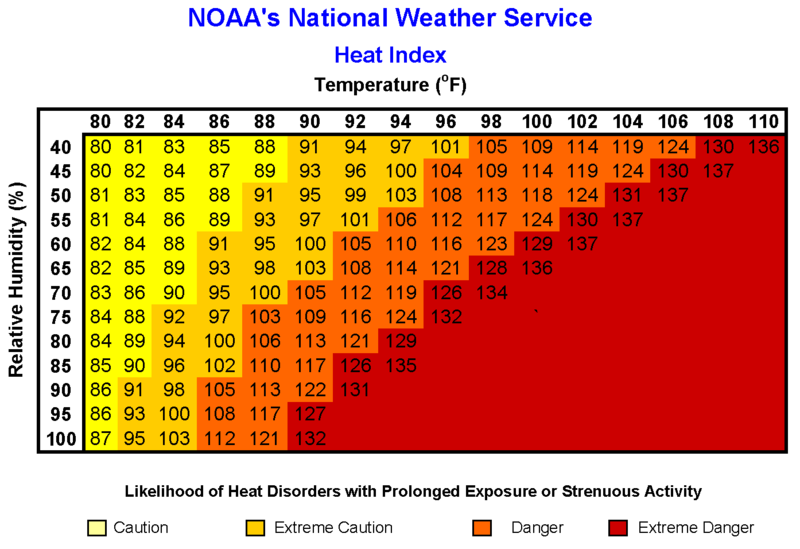 This will mean higher heat indices: The heat index is a measure of how hot it really feels when the relative humidity is factored in with the actual air temperatures. The heat indices will top out around 100 for Wednesday and Thursday and into the 100-105+ range by Friday and Saturday. The last time we had a “heat wave” (defined by our National Weather Service office in Sterling, Virginia, as three or more consecutive days at 90 degrees or above) was June 19-21. 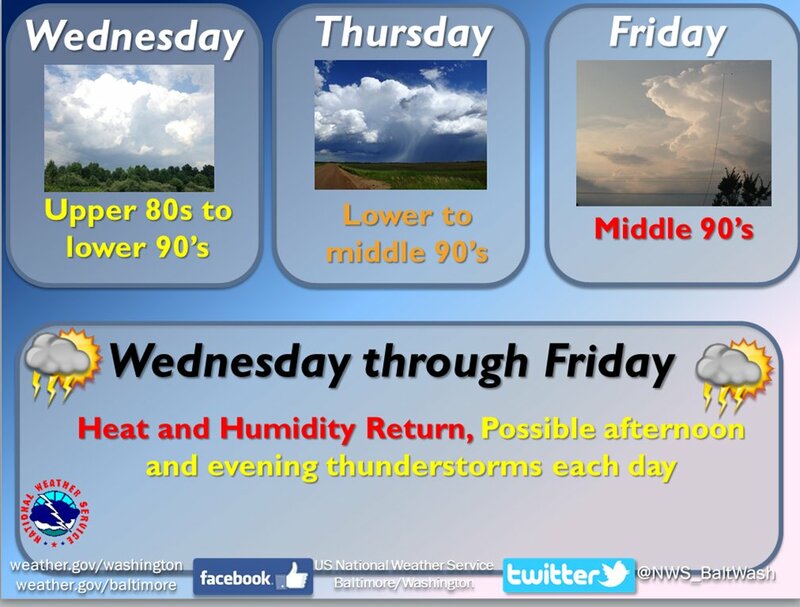 Keep it at WTOP and NBC Washington for information on potential heat advisories for this week! 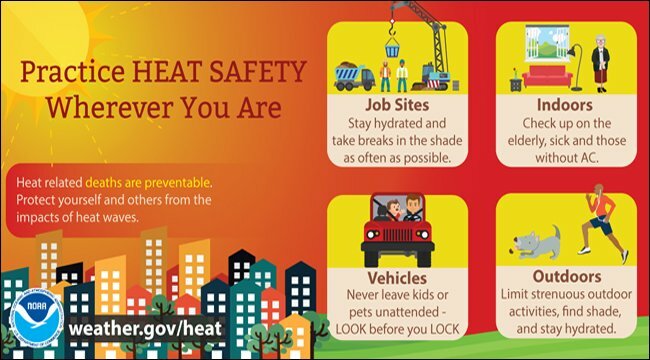 Also, make sure you are being safe when headed outdoors for an extended period. And even while the pool is an excellent idea for cooling off, make sure you lather on that sunscreen under the July sun! There is also a Code Orange air quality alert around the greater Washington and Baltimore areas. This means that air pollution concentrations within the region can become unhealthy for sensitive groups due to the stagnant, thick airmass over us. So here we are, entering the hottest period of the year so far. After Sunday, humidity will start to creep back in by Tuesday and Wednesday of next week. By that time, StormTeam4 will be watching another potential stretch of 90-degree temperatures by the middle of next week.